The Celtics are finally here. After stockpiling a seemingly infinite hoard of draft picks – young players with potential and assets – the Boston Celtics finally began their championship pursuit in earnest. The Celtics signed superstar forward Gordon Hayward to pair with established frontcourt star Al Horford and a plethora of young, talented players like Jaylen Brown, Jayson Tatum and Marcus Smart. The Celtics then dropped the proverbial boom on the the rest of the league, trading for Cleveland Cavaliers superstar Kyrie Irving. With elite young talent, relatively good depth, and a triumvirate of superstars, the future is now for the Celtics. The Super Friends are back. Dwyane Wade and LeBron James. The notorious, superstar duo that tore it up for the Miami Heat from 2010 until 2014 by winning back-to-back championships, are finally back together. The circumstances are a little different — they’ve traded South Beach for Cleveland, Ohio. LeBron’s got another championship with the Cavaliers, and neither star is quite the same caliber as they were during the “Big Three” era of Wade, James, and Chris Bosh. The supporting cast, formerly made of Mario Chalmers, Norris Cole, Ray Allen and Shane Battier has been replaced, now with the likes of Derrick Rose, Kevin Love, Tristan Thompson, J.R. Smith and Isaiah Thomas as Cleveland looks to topple the juggernaut Golden State Warriors. Regardless of how it goes, though, it’ll be good to see the incredible chemistry the two have on the court on display once again. The West is coming for Golden State. For the past few seasons, the Steph Curry-led Warriors have ruled the Western Conference, winning the West for the past 3 seasons and setting historical records for statistical dominance (especially after the arrival of former Oklahoma City Thunder superstar Kevin Durant). Now, though, it looks like they’ve got competition coming in the forms of the Houston Rockets and the Oklahoma City Thunder. The Rockets, guided by Durant’s former teammate James Harden, added elite point guard and former Los Angeles Clipper Chris Paul, forming possibly the best backcourt in the NBA. Meanwhile, the Thunder, led by 2016-17 NBA MVP Russell Westbrook, turned what had been a mediocre team into a playoff threat. 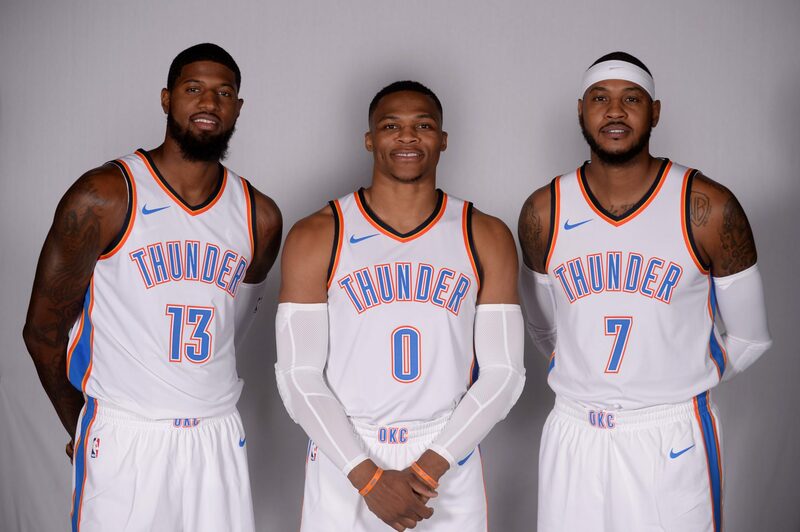 Through a series of trades, the Thunder added former Pacers superstar Paul George and long-maligned New York Knick Carmelo Anthony to form a triumvirate of star power not seen in Oklahoma City since 2012 (when Harden, Westbrook, Durant, and shot-blocker extraordinaire Serge Ibaka earned them a Finals berth against LeBron and Wade’s Heat.) 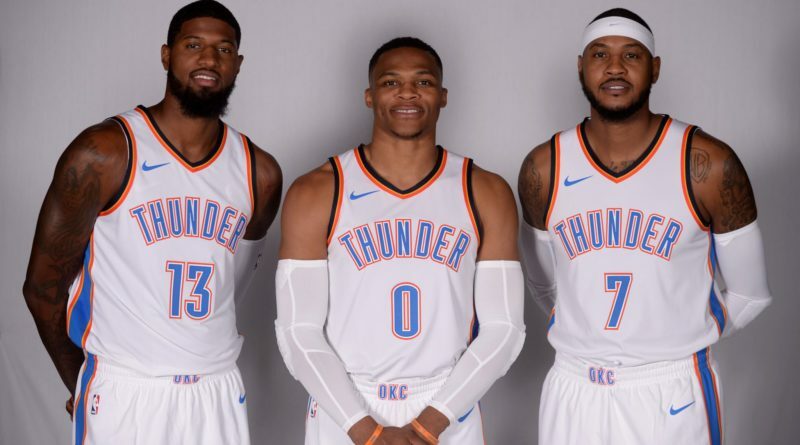 In a fateful twist, the trio of Harden, Westbrook, and Durant are coming to rule the West as many analysts had forecast years prior– just under completely different circumstances. Other threats, both in the West and East. While the Celtics and Cavaliers in the West, and the Thunder, Rockets and Warriors appear to be on a different level from the rest of the field, several other teams in both conferences look like viable threats to them as well. The Minnesota Timberwolves, already harboring young superstars Andrew Wiggins and Karl Anthony-Towns, added Chicago Bulls superstar Jimmy Butler, along with other major pieces like Jeff Teague and Taj Gibson to go from a perennially “upset-caliber” team to one that could make a huge splash in the playoffs. The San Antonio Spurs, behind coach Gregg Popovich and forward Kawhi Leonard, are nearly a lock to win at least 50 games and make a deep playoff run every season. Similarly, the Los Angeles Clippers and New Orleans Pelicans have superstar frontcourt duos with the capacity to carry them to regular season and playoff success (Blake Griffin and DeAndre Jordan for the Clippers, and Anthony Davis and DeMarcus Cousins for the Pelicans). In the East, the Toronto Raptors, Miami Heat, Milwaukee Bucks, and Washington Wizards always pose a threat to Boston and Cleveland, though they’re always a piece or two away from being true championship contenders. A New Era, for a couple of teams. Of course, with the rise of several teams into the upper echelon of the the league, other teams have to trend the other way, ushering in periods of rebuilding and retooling. The New York Knicks, for one, finally embraced Kristaps Porzingis as their franchise cornerstone, putting an end to the Carmelo Anthony era that had its high points but ultimately failed to deliver a championship. On the same line, the Chicago Bulls and Indiana Pacers shipped off their franchise cornerstones in favor of a rebuild, as both teams parted with their stars for what was essentially pennies on the dollar. Other teams started new eras with the drafting or acquisition of new players – like Lonzo Ball for the Los Angeles Lakers, and D’Angelo Russell and Paul Millsap for the Denver Nuggets. They might not be looking to win in the immediate future, but the long-term prospects of these teams are bright.